Travel to Eastern Europe offers souvenir hunters the opportunity to purchase high-quality, handmade gifts that can’t be found anywhere else in the world. These souvenirs reflect regional traditions, generations of knowledge, and pride of culture. When you travel to Bulgaria, look out for hand-crafted items that you can take home as a memory of your travels or as a unique present for someone who appreciates art and accessories from the corners of the world. Bulgarian pottery is characterized by distinctive patterns. 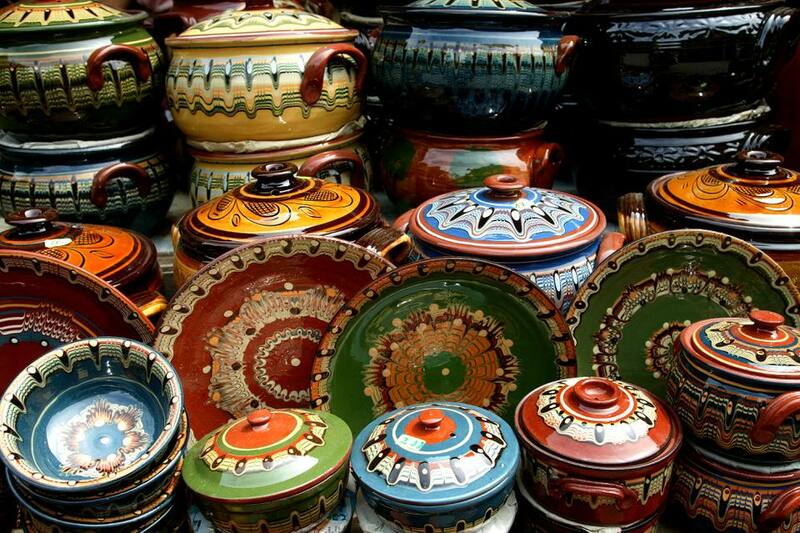 Troyan pottery is one of the most famous types of pottery from Bulgaria. The red clay is decorated with glazes in both multi-hued and more subdued color schemes. Large cooking pots are created with Bulgarian traditional recipes in mind, while items created for travelers who want to limit their luggage can be easily wrapped and tucked away for the journey home. Did you know that wine is grown in almost every part of Bulgaria? Bulgarian wine ranges from rich, full-bodied wines to young, light wines that are easy to drink and are produced by an increasing number of winemakers. Delve into this world when you visit Bulgaria to widen your palate and discover a favorite variety to take home. Bulgaria, as a rose-growing country, utilizes the rose to its fullest potential, incorporating it into beauty products and pressing the flowers for oil. Other products, such as mountain tea (also known as ironwort) and cosmetics made from other local herbs, can be found. From Bulgaria come master wood carvers, who can transform any ordinary wooden object into a thing of artistry. Three major traditions of wood carving exist in the world of Bulgarian wood carving: shepherd-style woodcarving, woodcarving for the home, and religious woodcarving. Shepherds’ woodcarving evolved as shepherds tending their flocks used their time to carve useful but beautiful objects, such as spoons or candle holders. Woodcarving for the home was used to decorate the interior and exterior of the home. Religious woodcarving is considered the most complex, and this style can be seen used in iconostases and as frames for individual icons. Bulgarians have translated their craft into useful and attractive souvenirs for travelers, including boxes and other decorative objects. Icon painting is a Bulgarian craft with deep roots. Originally an art developed in Byzantium, from which Orthodox Christianity comes, it follows strict rules that the artist must adhere to, which accounts for the icons’ particular style and the similarities from icon to icon. Due to these restrictions, icon painting is not a skill just anyone can master; it takes study and practice to create authentic pieces that honor the tradition’s highest standards. Bulgarians have been perfecting their leatherworking skills for centuries. The tanning and dying of leather is an arduous process that results in a material ready to be turned into bags, shoes, hats, and other wearable items. These are either decorative or utilitarian or both. A cozy pair of sheepskin slippers or a warm cap are easy-to-pack souvenirs that will last for years. Bulgarian jewelry sporting traditional motifs bears a distinctive look. Filigree, scrollwork, nielo, and enamel work are integral to jewelry objects preserved from the past. Contemporary jewelry artists sometimes incorporate the techniques and motifs of their forebears to produce jewelry that reflects a long-established custom of decorating the body as a part of the Bulgarian national costume. Good examples of Bulgarian jewelry can be seen in the archeological museum in Plovdiv. Buckles of sophisticated designs were sought-after objects to complete an ensemble the past, but jewelry artists in Bulgaria create art that is wearable for modern people. Weaving is an ancient tradition in Bulgaria. It uses natural plant and animal fibers to produce rugs, carpets, and blankets of distinctive design and quality that reveal influences from ancient cultures. Weaving and the possession of a loom were necessary as a part of traditional life to create useful objects for the home. Floral and geometric designs in a variety of color schemes mean that rugs and carpets from Bulgaria can be found to suit any taste or interior decor. Today, the practice of weaving is preserved through dedicated craftspeople. Two centers of rugmaking are found in Kotel and Chiprovtsi.